I have never had nor done a banana bread until today. I have no idea why. How could that AWESOMENESS not have caught my attention before? I feel like I have wasted a bit of my life. SO, I will make it up to you dear banana bread. 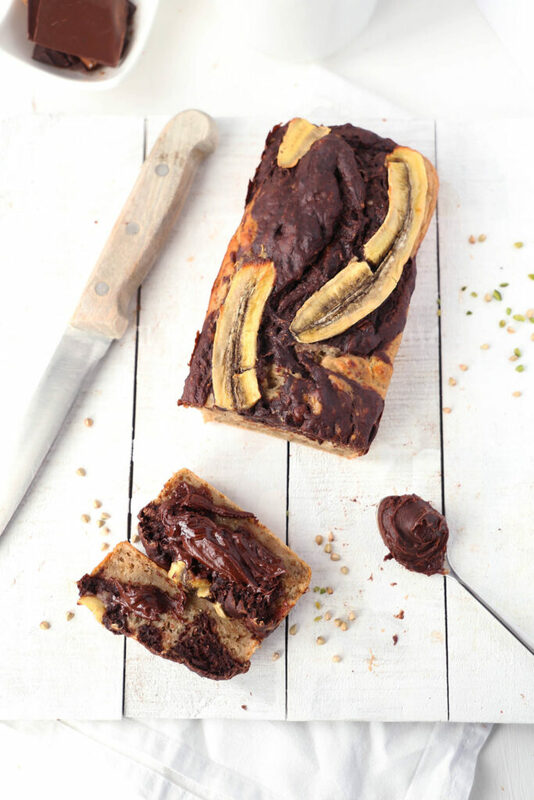 Last Sunday we had an amazing brunch and my friend Fanny brought this banana bread with a chocolate layer. The fact that there is something with chocolate on is reason enough for me to taste it. When I tried that first bite, that slightly warm banana and chocolate flavor in my mouth, I went straight to heaven and never back. Combine the mashed bananas, melted coconut oil, maple syrup and the chia seed water mixture into a mixing bowl. Mix until well combined. Pour the plain batter into a lined loaf tin and top with the chocolate half. Take a knife and “cut” through the batter a couple of times to create a marbled effect. Bake for 40-45 minutes or until a toothpick stuck into the middle comes out clean. Let it cool for a bit before slicing. 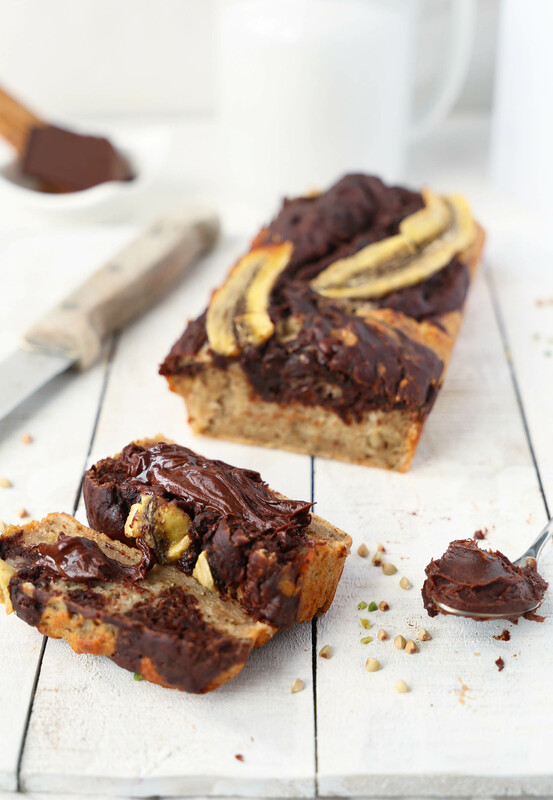 This post is dedicated to my friends Fanny, who came up with this genius chocolate-banana bread idea! Thank you so much much for this receipe! I made this yesterday but in the round tin so it is look like cake for boyfriend birthday and it is definitely the best banana bread we ever had. I do not have chickpea flour, what can be a good substitute for this? Sorry I am correcting it asap! The almond milk was left out of the directions for the batter. “Despite what you might hear from that bakery owner and others, spelt is, in fact, a form of wheat. Like other forms of wheat, spelt contains the gluten protein, and therefore, isn’t safe for those of us who have celiac disease or non-celiac gluten sensitivity. You can try! I never did but I think it shouldn’t be a problem. Let me know how it turns out! Hey Lara! 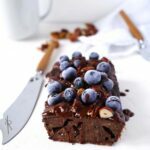 Can I use buckwheat flour instead? Thanks! Omg this totally made my day! I made a screenshot ❤️ thank you soooo much! The other day on Instagram I told you that I made this three times in one week! 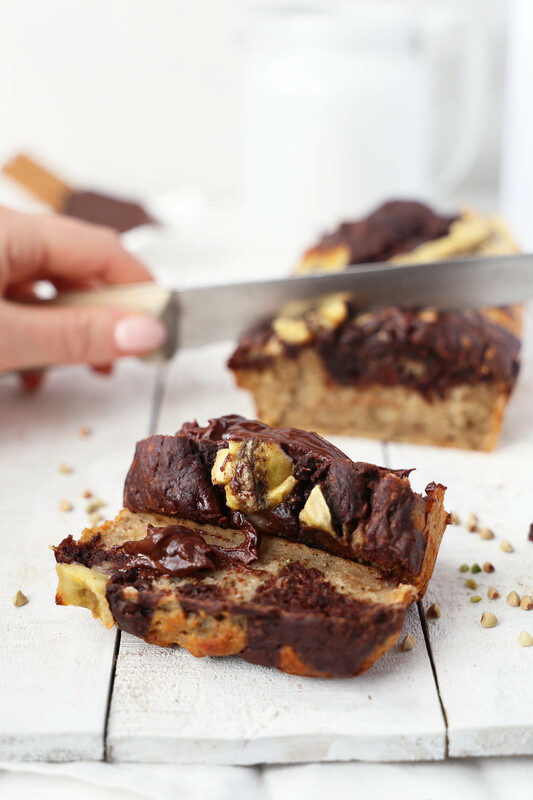 I wanted to try this banana bread ever since you posted the picture on Instagram but each time I would just stick to my go-to healthy banana chocolate chip bread recipe, which I really love. I cannot tell you how happy I am for finally trying your recipe Lara. More bananas, less oil, and the marble idea is just genius!! My bananas were just ripe the first time, I used honey as a sweetener and I used a little less than 1/3 cup. It was still a little sweet for my taste. The second time I reduced the honey to a little less than 1/4 cup and also made your dark chocolate hazelnut spread…. my goodness, I instantly fell in love!! The spread is pure YUMMINESS on its own! and with the banana bread, ahh it’s just hard to find words that best describe how I felt when I had that first bite! Hello Lara. I really like your blog and love your instagram account. I just have one question. Why do you use cups and not grams etc. or both if you are from Switzerland? Keep up the good work, you’re awesome ???? glutenfree spelt flour? I think its been mislabeled? Spelt contains gluten and as far as i know there is no way of removing it. Would you mind sharing what brand it is so i can have a look at it? I never tried but I think it is worth a try 🙂 let me know ???? Do you think brown rice flour would work? Spelt flour is not gluten free, so please proceed with caution if you have a gluten allergy. I’m going to try this with a gluten free blend from Trader Joe’s. It looks delicious! Could I use other plantbased milk for the coconut milk? In my country we don’t have gluten free spelt flour, which other gluten free flour do you recommend? Yes totally works! Yes and when you add nutella to it it’s even better! Can I sub the agave for maple syrup? Anyhow, it literally looks like nutella banana bread with the nutella just oozing smoothly on top of the first layers! So delicious! You have to give it a try I swear you’ll love it! I still haven’t made a banana bread for my blog!! 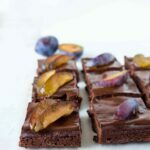 I feel no need to when bloggers like you create amazing recipes! The chocolate swirl is unreal! Spelt flours that are not. However spelt and whole wheat both work. Are you gluten intolerant? This looks and sounds AMAZING! Can I use maple syrup instead of agave?